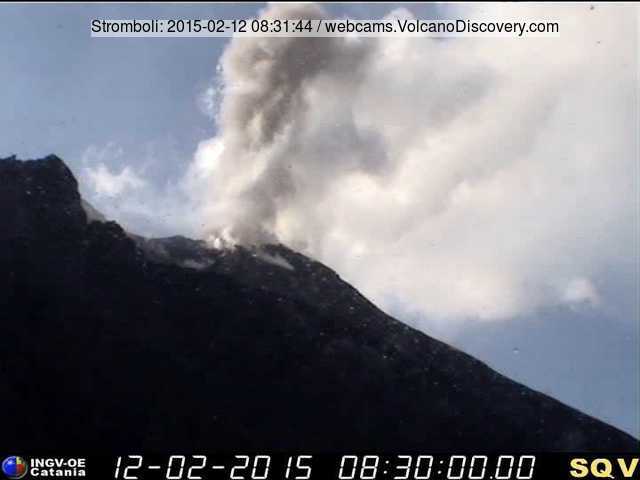 Stromboli (Eolian Islands, Italy): The currently weak, sporadic strombolian activity from the summit vents increased during the past night when explosions became more frequent. A small peak in otherwise low tremor occurred a day earlier (9 Feb). Soputan (North Sulawesi, Indonesia): The eruption continues with an active viscous lava flow on the upper western flank. Occasional explosions such as this morning produce ash plume that rise to 3-4 km altitude, i.e. 1.5-2 km above the volcano. Dukono (Halmahera): An ash plume to 12,000 ft (3.6 km) altitude was emitted this morning and observed on satellite data extending 35 km to the south (VAAC Darwin). Reventador (Ecuador): A new lava flow seems to be active on the southwestern flank. Occasional explosions continue from the summit vent where a lava dome is growing.